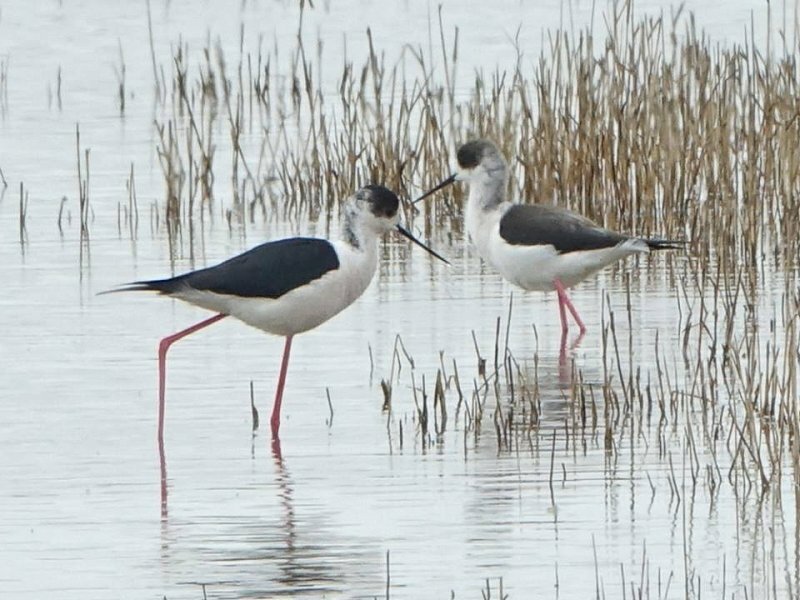 Highlight during April was two black-winged stilt on Harbour Farm between the 8th and 10th of the month. This elegant relative of the avocet is a very rare visitor to the reserve, with only a handful of records and the only other occurrence of more than a single bird was in 1949 when three were recorded. Since 2000 this species has become more regular in the UK, with greater numbers and nesting attempts, and in 2017 at least 13 young were fledged in Kent, Cambridgeshire and Norfolk. Migrant waders included the first whimbrel of the year on the 7th (with up to 13 seen subsequently), small numbers of black and bar-tailed godwit and grey plover and a greenshank on the 20th, while golden plover numbers dwindled from around 250 on the 1st to a single bird on the 27th. Around 50 pairs of avocet set up home on the Beach Reserve and Harbour Farm, with some birds already sitting by the end of the month, while displaying little ringed plover were heard on Harbour Farm on the 23rd and 25th.Still good numbers of waterfowl at the start of the month, though numbers dropped off as birds began to move away. Notable records included black-necked grebe on Castle Water on the 16th, the long-staying red-breasted merganser throughout the month, great white egret at Castle Water on the 15th (two) and 17th and three spoonbill on the Beach Reserve on the 31st. Maximum counts of our breeding seabirds during April included 1500 black-headed gull, 600 Sandwich tern and 143 Mediterranean gull, while the first common tern were seen on Harbour Farm on the 8th and the first little tern here on the 20th and visiting little gull were on the Long Pit on the 8th and 11th. 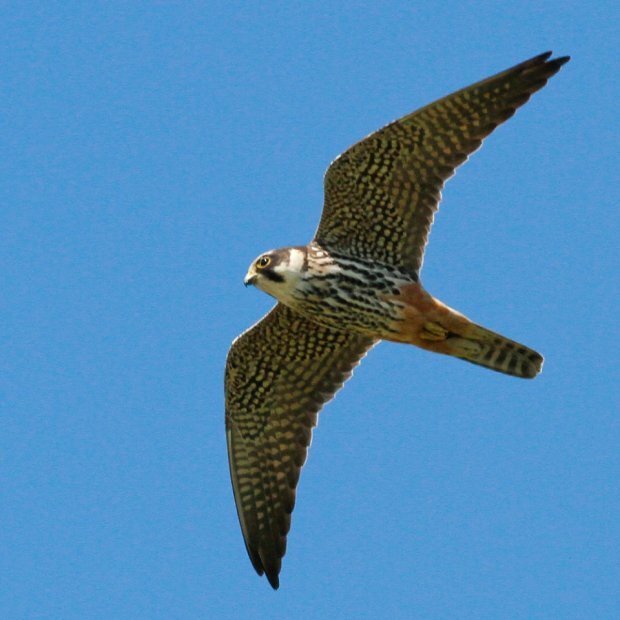 Raptors during April included regular sightings of marsh harrier and peregrine at Castle Water, a buzzard over the Beach Reserve on the 2nd and the first hobby (above) of the year at Castle Water on the 27th when two were seen. The highlight, however, was a red kite which was seen briefly over the area near the viewpoint on the 20th. As might be expected at this time of the year, passerines during April included a range of migrants and summer visitors, many seen for the first time in 2018. This included swallow on the Beach Reserve on the 7th, yellow wagtail on Harbour Farm on the 11th (along with singing corn bunting), cuckoo at Castle Water on the 15th and swift on the 25th, while at Castle Water sedge warbler, reed warbler, whitethroat and lesser whitethroat could all be heard singing by the end of the month. Best of the bunch were a nightingale which was heard near the viewpoint at Castle Water on the 24th and a grasshopper warbler on Harbour Farm on the 14th. 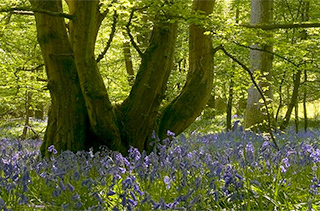 Some fantastic insect sightings during April, mainly on the 20th when entomologist Steven Falk and wildlife trust ecologist Graeme Lyons visited Castle Water with yours truly. 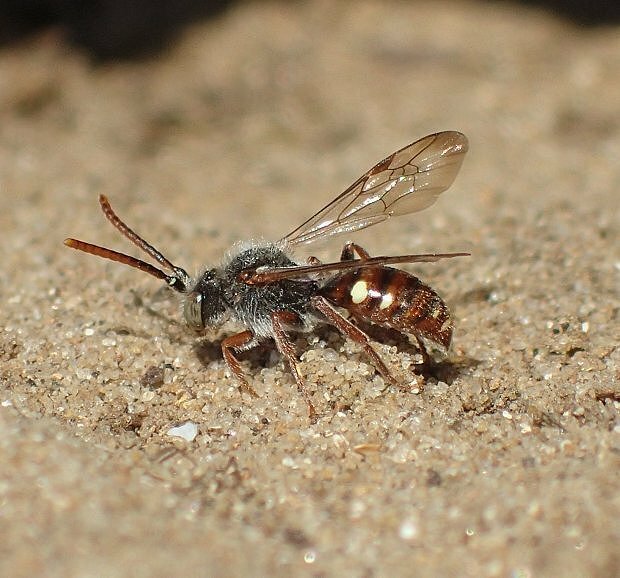 Highlight was large bear-clawed nomad bee (Nomada alboguttata, above), a rare ‘cuckoo’ bee which was only added to the British list in 2016 from Kent and discovered at Rye Harbour last year. What's more, at least two were males, the first ever found in Britain! We also turned up grey-backed mining bee, vernal colletes, large garden bumblebee and red-shanked carder bee as well as lesser-striped shield bug, dotted bee fly, the rare money spider Trichopterna cito and the even rarer weevil Limobius mixtus! In addition, Peter Greenhalf found the wasp Dolichovespula media at Castle Water on the 26th, the first record for the reserve. Plants in flower included sea campion, common storksbill, blackthorn and hawthorn.